This edition of Film Appreciation explores the original Hitcher and how it helped inspire Jay Burleson's next feature film. I don't remember it, but my father tells me that as a child I owned a VHS copy of the 1986 film The Hitcher. Apparently I would come home from school and watch it every day. This went on for a few weeks or so, until I undoubtedly moved on to another film. 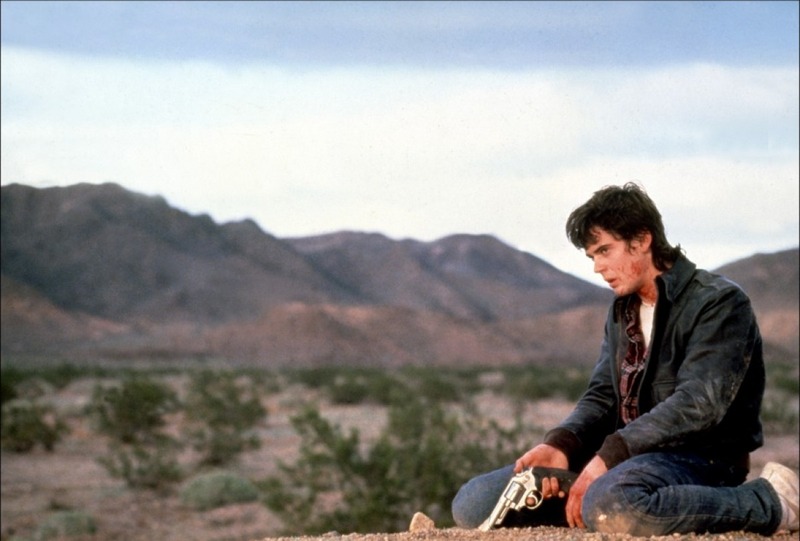 The Hitcher is quite a disturbing film starring Rutger Hauer and C. Thomas Howell. The fact that I was watching it at such a young age says a lot about the filmgoer as well as the filmmaker that I've grown up to be. The plot revolves around a young man (Howell) who picks up a hitchhiker (Hauer) and then must fight for his life to stay alive as the hitcher puts him through a gut-wrenching sequence of events. The film is full of suspense and an impending sense of doom. I've never forgotten the sick feeling that its cat and mouse games left me with, nor have I forgotten the lonesomeness of the open road as it is portrayed here. It's well directed by Robert Harmon and features great performances from both Hauer and Howell. The lovely Jennifer Jason Leigh also has a great part here, though her demise is one of the most wicked parts of the entire film. I love the harsh settings in this film and I've always felt certain movies have an added element to them by way of the VHS format, in particular worn VHS copies. This holds true to how I remember The Hitcher from those childhood viewings. The lo-fi elements of the format itself lend an even bleaker environment in the film. The film didn't play much of a role in my life after the early VHS watchings, but its obvious mark on my brain is hard to miss. As a sophomore in high school, I shot a short film with the help of a few friends called "Hitchhiker" and it's basically the same premise as "The Hitcher", only with slightly more comedic elements thrown in. My Hitchhiker was centered around a character from a previous short, Johnny Knickerbocker, who lost his arm at the hands of two lunatics. In Hitchhiker, Knickerbocker picks up a man named Taboris Dewitt and once again faces off with evil. I shot it on the old VHS-C format, which was pretty popular during my youth. It's just another example of how VHS has played such a huge role in my life-- just as much as any film. For years neither The Hitcher nor VHS or VHS-C entered much into my day-to-day. The Hitcher became a forgotten film of my youth and, just like everyone else in the world, I moved on to DVDs. I continued watching and loving film and as soon as I was old enough to start shooting my own, I did. I knew from a very early age that filmmaking was my true passion and threw myself into a feature at the age of 19. We were severely in over our heads, but myself as well as most of my friends had the times of our lives. Even though the attempt at a movie was a complete disaster, it sealed my fate as a filmmaker forever-- for better or worse. I learned most of what I know now on the fly, and from other films such as John Carpenter's Halloween and various gems by Roman Polanski. The Hitcher and its influence on me never entered my mind anymore. It wasn't until earlier this year that I rediscovered all of the old VHS-C tapes from my childhood and decided to put some of those stories to work. I resurrected old characters like Johnny Knickerbocker as well as Taboris Dewitt and decided to give them the feature film treatment. Only instead of taking the old characters and shooting them in a crisp HD format, I decided to shoot the film on VHS-C. The film, titled The Nobodies, stars Pop Skull and A Horrible Way to Die actor Lane Hughes as Johnny Knickerbocker and Atlanta-based actor Bill Pacer as Taboris Dewitt. The story is set in the early 1990s and is an extremely over-the-top horror/comedy romp with a twist-- the shot-on-VHS horror is presented as a movie that was actually made twenty years ago, and the director killed himself after it killed his career. The Nobodies is the director's crazy horror movie in its entirety, mixed with archive and interview footage of the people who made it and how it changed their lives. It's kind of fitting how it all works together. 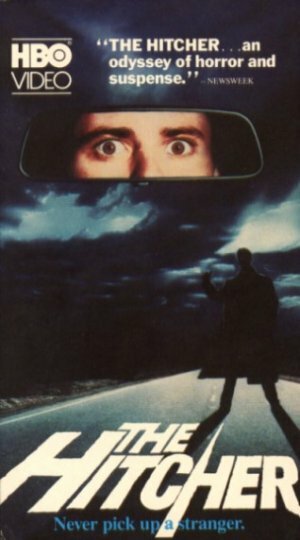 The Hitcher was an obvious influence on me as a kid, VHS was the key to getting all of these movies in my youthful hands, and the easily accessible VHS-C format helped to get my own hitchhiker ideas out on tape. In a world where anything popular makes a comeback at some point (see The Hitcher as one of the slew of remakes over the last few years), even VHS has made its comeback in popular culture. Ti West's '80s-styled horror hit The House of the Devil got a VHS treatment upon its release to home video a few years back, and numerous other arthouse directors have used the format for their own homegrown projects. The upcoming horror collaboration V/H/S/ (a 2012 Sundance premiere which has been picked up by Magnolia) is a new take on found footage that also features footage shot on VHS cameras. Even my first attempt at a feature, Feast of the Vampires, was transferred to VHS to add a bit of mom and pop video store nostalgia to it. 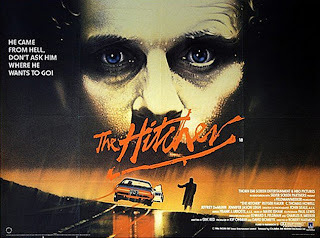 As much as I can attribute my current project to VHS and VHS-C, a lot of the credit also belongs to The Hitcher. As I watch back over it now, I realize just how many elements the film touched on that still inspire my work today. It captured my wild imagination and surely accounted for my love of road movies and stories centered around characters outside of their natural habitats. 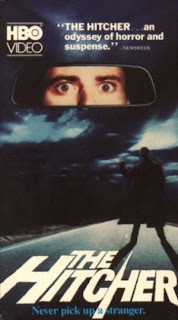 From the hitchhiking aspect to a nice motel scene between C. Thomas Howell and Jennifer Jason Leigh, Hitcher makes great use of many storytelling devices that I find stimulating. It embodies the remoteness of the open road, as well as the loneliness of a dire situation, and is just an all around enjoyable film. It got lost along the way once, but I'll make sure to never let that happen again. The Hitcher was worthy of repeat viewings during my childhood and it still is today. do you still had that movie? The Nobodies?